Have you met a fellow blogger before? Well, I met LuAnn of Paint Your Landscape some months ago this year. 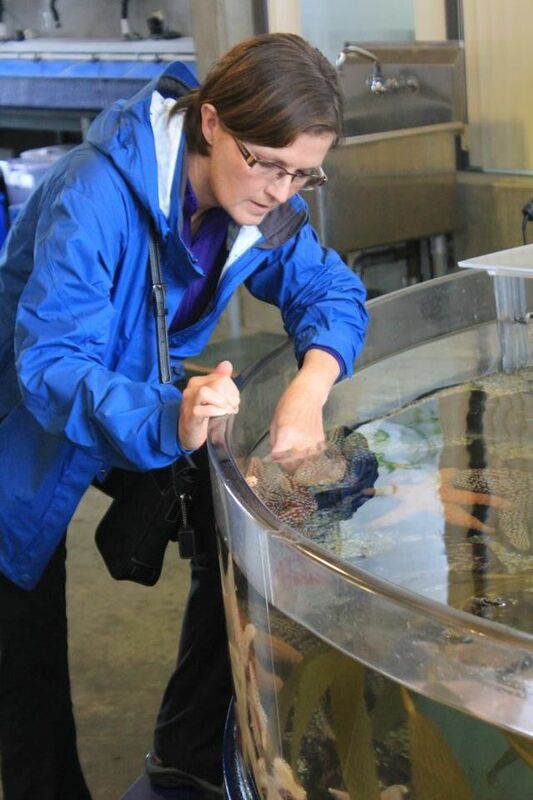 We greeted each other personally for the first time at the Ocean Institute. 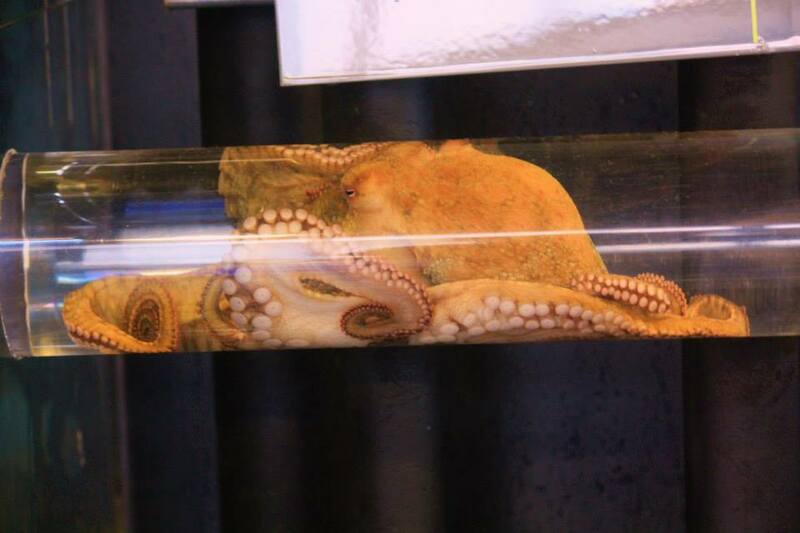 We saw an octopus passing from one tank to another tank through a tube. She dipped her hand to feel the starfish. There were children learning how to dissect a squid. We wander around eyeing more aquatic animals. After that, we decided to look around the area to see more of Dana Point. 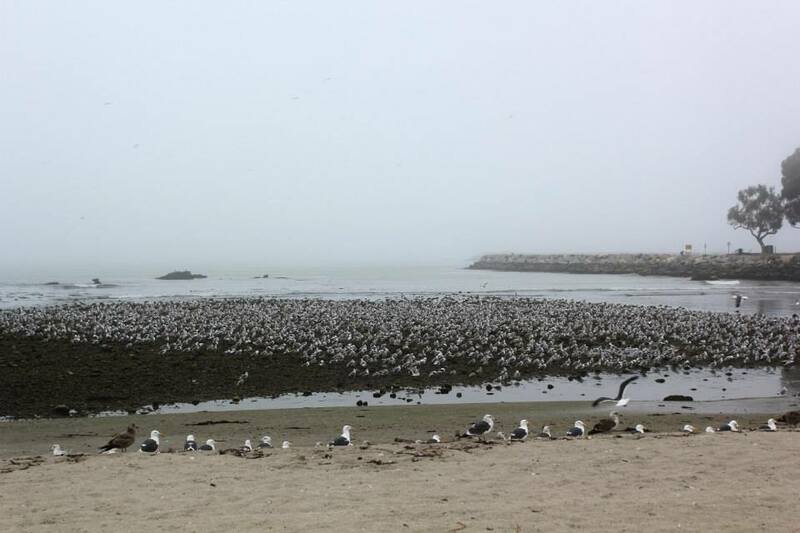 We took a walk, talked trash about other bloggers (I kid, I kid), and spotted a bed of familiar birds. We ate a nearby restaurant, talked some more trash about bloggers (I joked for the nth time), and then parted ways. Before all these, I warned her that I might suffer a panic attack out of social discomfort. I think the only sign was that I snickered a lot. Well at some point, a homeless guy asked us for some spare change. Me and Lu looked at each other. Here we are, two strangers, only were connected through blogging and were meeting in person, and this random event occured…. Neither of us pulled anything from our pockets. Personally, there are just other ways to help these people. What I’m really getting at is I think it says a lot about how we approached each other. There was no measure of modesty, no pretentiousness, or we don’t have to act like we can walk on waters. We were in our normal selves. That’s exactly what I wanted. I have to know that I can be whacky, make mistakes, or be serious, in order for me to be comfortable around someone I just met. I’m glad I didn’t have to use a paperbag I reserved in case of palpitation. 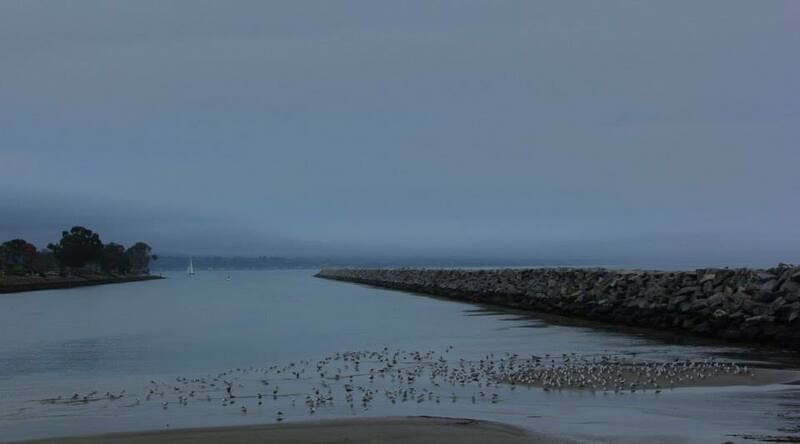 Now, I can look back at Dana Point in a more distinctive way than my other California travels. 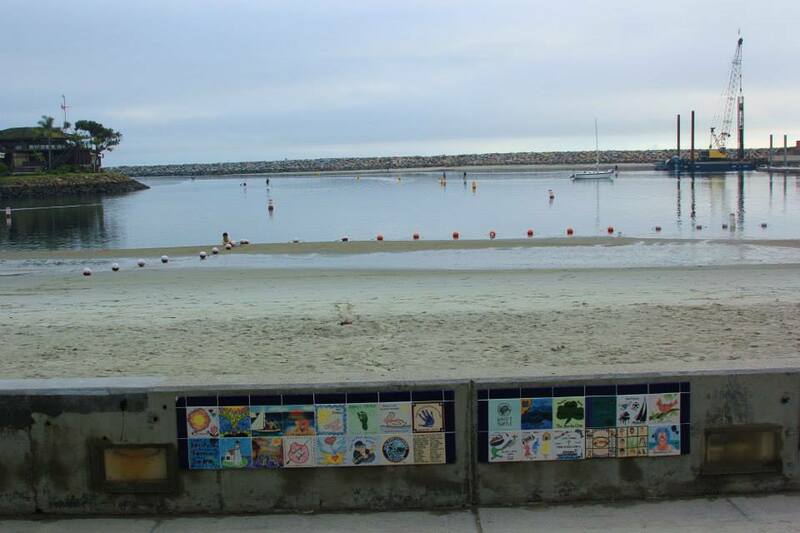 See LuAnn’s post about Dana Point. Also I found a company who might find that getting to the harbor ain’t that easy. Read it from Angelina Sims of Living, Loving, Laughing…. As for my Throwback Thursday picture… For your amusement …. 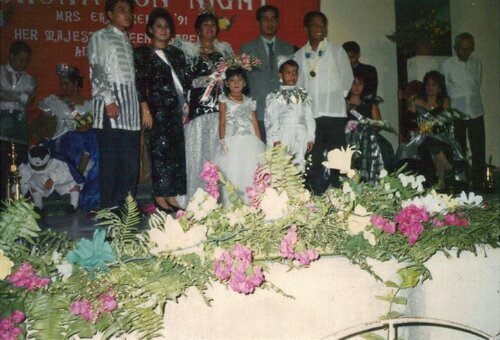 Me, my cousin, my father, the city mayor, some extras 😀 and my mother who was crowned Mrs. East Rembo (my hometown district) of ’91. Dana Point looks like a beautiful place! Anything with water and high cliffs does it for me. What a fun day and OF COURSE you’re part of the click. I met LuAnn about a month after you met her (so I know you weren’t talking smack about me 😉 ) and I also met Mona Liza (Lowe’s Adventures)…. Two of my fave blogging pals. So one day I’ll need to meet you in some way off place 🙂 Happy trails and lovely photos as always….blogger meet ups are the best! It sounds like you had fun, and the next time you’re in California, you’d better let me know. I’ll supply the paper bags! Oh cool! San Fran, right? That can easily be arranged. This was written 6 months ago but San Fran – I’m here . Put me on your list of bloggers to meet 🙂 Let me know when you are in town. What a beautiful place to meet! Oh, boy the first impression… 🙂 😉 You said you wanted to come to Texas… you’d better let me know when you do 🙂 I Love LuAnn’s blog. What a cool photo of your family, Rommel! Believe me, if not for work, I’d be more than glad to come back to Texas. LuAnn’s blog is AWESOME. Weeee! Too bad it’s not me. 😀 I sensed it even from before that you’re very approachable and are very comfortable engaging with others. What took you so long to meet a blogger? Hehe. 😀 Have fun with your meet. Lovely Christine will be very very lucky to have you as company. Very nice post about meeting LuAnn. I love reading her blog and hope to meet her one day as we travel the country. Hey, you are so fortunate to meet LuAnn, I still have to meet her somewhere someday. It is always cool to meet fellow bloggers, the real person behind those great adventures. Did you get assigned to Phil to help? When we get back to CA, we have to, i say we have to meet. Wait, you two haven’t met? I was so convinced you two already did. I grew up in Makati. No, we were warned to get ready, but we never got the green to actually head there. As long as there are some sort of help and I’ve done even the littlest ways to help, I’m still cool not being able to go there. it is always good when meeting new people, especially those who close enough through blogs. How nice to meet a fellow blogger in such a beautiful environment. I have family in Dana Point so it’s on my path quite often. It’s always so lovely to see the Ocean Institute and the distinct rules about protecting tidepools and ocean life. 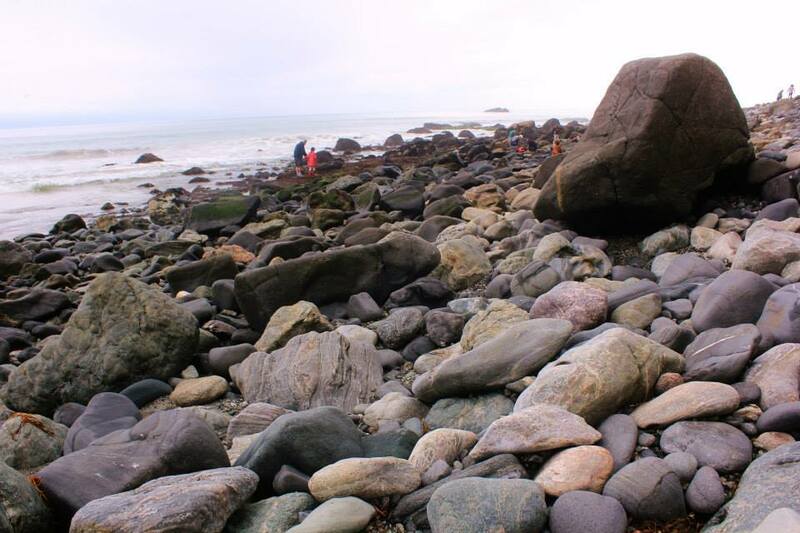 When I was a child, back in the dark ages, Dana Point was very well known for abalone. But we were rather ignorant back then and we would harvest abalone without any restrictions and at least for awhile there weren’t any abalone to be found. 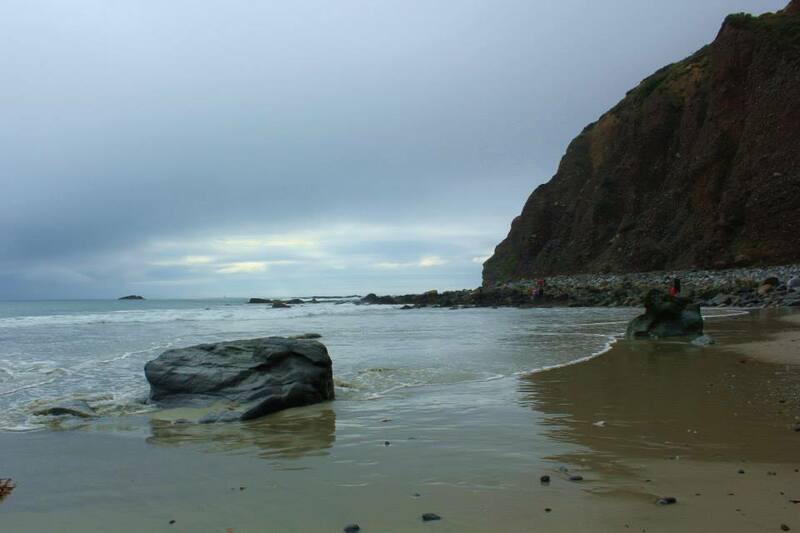 The cove at Dana Point is really a jewel and your photos demonstrate that! Nice memories for you to have. I knew you have some sort of connection with Dana Point. Wait one, Debra. I’m Googling what abalone is. 😀 …………….. Ahhh, I see now. 😀 Thank be to the people who always strive for the preservation of nature for us future inhabitants can appreciate them. What a gorgeous place to spend some time with a fellow blogger. 🙂 LuAnn comes across on her blog as a really lovely lady. Glad you had fun together Rommel. I’m afraid my hammock swinging days are at an end. I’ve started a new blog to replace the old one. Why start a new one? You established a great blog already. Wait, I guess I just answered it. Hey there! how are you? been MIA in blog land… I got pissed off with WP so I stopped but I eventually missed the blog life so here I am again, forgiving and forgetting wp mistakes. Anyway, I hope I am not that famous to be a part of that trash talk about bloggers, 😀 I’d kill yah if I weren’t part of it. Great post and reminds me to visit this place. I have been passing by the area over and over but never cared to stop. Thanks for this. btw, hope you’re fairing well in JP. yeah? Yup, wordpressers keep on pressing. You’re premdev? Prem, how come I can’t comment on your blog. Even when you first told me you changed your blog up to now. Oh what fun Rommel…can’t wait til the day we meet my friend. You can be just as yourself as you want. But can we please not go anywhere where they dissect anything huh ???? In case you missed it on FB…Happy Birthday for yesterday !!! Being for real. That’s what I call it. That’s how it was when I met a fellow blogger this past summer. Great post. Haha…No matter how hard you joke, the obvious is coming out. You do know how to joke. Your, for lack of a better term,”parenthetical humility” made your delivery funnier all the more. I wish I get to travel with a fellow travel blogger again soon…to talk trash about other bloggers (I was joking!). Talking trash about other bloggers is mean, Sony. Ha, I so enjoyed your description of your day with LuAnn, even if it involved ‘trashing’ me 🙂 You couldn’t have chosen a more fabulous setting! And I love the flash back shot Rommel. What a brilliant meet up Rommel .. how could you and Lu Ann NOT get on ! Sounds and looks from your pictures a great success . Thanks for the comment and visit. on the Opinionated Man’s blog as a guest author in two months? I will credit the photo back to your blog, though I can’t promise it’ll be a link per se. I would note your site address, of course. On the small chance you don’t know, he has a following of about 27,000. I’m also not positive I will do this, but wanted to secure your okay on the likely chance I would like to at time of posting. Will let you know – remember, it’ll be in 2 months – if I do. And you will probably get a pingback anyway.